So about two months ago I was out doing some grocery shopping when I got a call from an athlete of mine who is currently playing minor league baseball. For the sake of this article, let's call him Tim. Before we get to the phone call, however, let me give you a quick backstory: Tim is a very good athlete who put in a lot of hard work this offseason and managed to take his fastball from high 80's to 93-96 MPH. For anyone who has played baseball, and played for an extended period of time, you'll know these type of velocity jumps are hard to come by. As an unrelated aside, I hate when coaches try and take all the credit for their athletes improvement. Yes, good programming and coaching makes an enormous difference, but at the end of the day nothing is possible if the athlete isn't making the sacrifices and putting in the time to get better. Anyways, when I picked up the phone I could immediately tell something was wrong and it didn't take long to figure out why...Tim's velocity had disappeared. Just several weeks before he was sitting 93-96 MPH, but now that he had been at spring training for a few weeks his velocity had dropped to 85-88 MPH. If you aren't a baseball person, that's a big drop and is enough to make a team reconsider signing you. After we spoke for a little while, and Tim filled me in on what all they had him doing, it became crystal clear why he was experiencing so many problems: his true preparedness level was being masked by fatigue. Over the past several years there has been a BOOM in tracking software that allows coaches to see how their athletes are recovering, and how ready they are to perform on a specific day. Whether we're talking something as simple as tracking daily fluctuations in Heart Rate Variability, or something as complicated as Omegawave, the end goal is the same: coaches want to know the status of the athlete right now to make the best training decisions for the day in question. While this concept of readiness and preparedness is a simple one, it unfortunately gets routinely overlooked and deserves our attention. To help better understand the relationship between preparedness and readiness take a look at the graph below. The graph above is owned by Omegawave and Val Nasedkin. It does an incredible job displaying the concepts we're talking about today, and I couldn't recommend checking out their software enough. Furthermore, much of the verbiage we'll be using today comes directly from them. While there's a lot going on in the graph, I want to draw your attention to the two main pieces we're focusing on today: readiness vs. preparedness. When thinking of preparedness, think of it as your overall fitness level. In other words, it's the accumulation of all the work you've done over time. Thus, it's a long term quality. You aren't changing your overall level of preparedness in a single day or one week, we're talking about training for months and years to acquire truly high levels of preparedness. 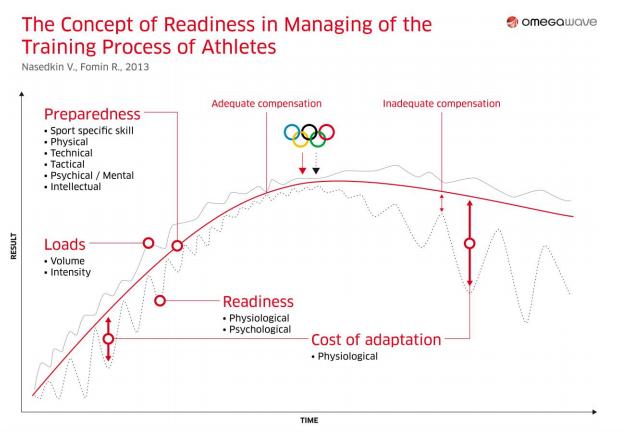 Readiness, on the other hand, is a short term quality that merely reflects the athlete's ability to display his or her preparedness level on a particular day. For example, let's say you take an athlete out to run 100 meter sprints at 100% effort on Monday. What do you think will happen to their readiness level on Tuesday? It's going to drop, and it's going to drop because you have created fatigue. You have essentially masked the athletes true preparedness level with fatigue. In the offseason, this isn't actually a bad thing when managed properly because in order to create adaptation we have to stress the system and generate adequate amounts of fatigue. In fact, it's a major part of the offseason for highly competitive athletes. Grab them in the middle of a grueling training cycle and you'll see performance levels below what they're truly capable of. That's just how the training process works. If you'd like to see a real world example of this process, you should checkout this article by Lance Goyke on fight conditioning. You'll notice fatigue is generated, but once the athlete tapers things change drastically. "Fatigue is the mask behind which fitness hides. It’s fun to wear masks, because nobody really knows who you are. I live a life of reverse Halloween. I wear a mask nearly year round, and it’s called fatigue. Every now and then I enjoy reverse Halloween days, and I take off my mask. When I take off the mask, then you see that a monster was living there all along, and I do things that may seem scary to most. Training is the process of living in fatigue for most of the time. Training is the reverse Halloween phenomenon. Training is how rabid dogs learn to put the foam away behind a mask. And then there are the reverse Halloween days where the real monster, who has been masked by the regular guy face unveils the beast that has been lurking in the shadows all along. You can’t let the monster out too often. It’s not safe. You keep the monster hidden away by masking it with fatigue. Fatigue is the chains that keep the monster from destroying the city. Every now and then it can be fun to take off the chains though. Remove the fatigue and let the monster rage." Out of respect for Tim and the organization I don't want to get into any specifics, but the above gauntlet is more or less what he was being told to do on a daily basis. Thus, it's really no surprise his velocity disappeared. And just to prove a point, once Tim left camp and got back into a good routine his velocity immediately jumped back to 93-96 MPH #takethemaskoff.